Bangladesh and the UK have historic relations and traditional friendly ties. Bangladesh recalls with deep gratitude the support of the British people across various constituencies and that of the then British political leaders during the Liberation War in 1971. Upon his release from a Pakistani prison, Father of the Nation Bangabandhu Sheikh Mujibur Rahman returned to Bangladesh on 10 January 1972. 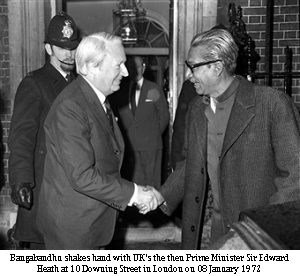 En route to Dhaka, Bangabandhu stopped over London where he had a meeting with the then British Prime Minister Sir Edward Heath at 10 Downing Street. This laid the foundation of special nature of the relationship between the two friendly countries. The UK was among the first of the European countries to recognise Bangladesh on 04 February 1972 and that influenced quick recognition by other Commonwealth and Western countries. Mentionable, Bangladesh became a member of the Commonwealth on 18 April 1972. The expatriate Bangladesh community living in the United Kingdom played a significant role during the Liberation War to garner the support of the people and the Government of the United Kingdom and the diaspora, which is now about half a million, remains a key linkage of the growing bilateral relations between Bangladesh and the UK. On aviation security issue, the UK authority has lifted the ban of air cargo from Hazrat Shahjalal International Airport, Dhaka to the UK at the beginning of this year. The cargo movement has already started. The two countries are still continuing cooperation in the area of aviation security. The UK Government has so far contributed £129 million for the 'Rohingya' crisis and suspended educational training programmes for the Burmese military. The UK showed leadership in raising and coordinating the issue in United Nations Security Council. UK Ministers and MPs raised concerns in Select Committees, parliament debates and outside the parliament and created pressures on the Myanmar government. The United Kingdom hosted the 25th meeting of the Commonwealth Heads of Government (CHOGM) held from 19-20 April 2018. Heads of State/Government from 47 Commonwealth member states, and Minister level delegations from the rest attended the CHOGM 2018. The pre-CHOGM Commonwealth Foreign Ministers Meeting (CFAMM) and the four Commonwealth Forums (Women, Business, Youth and People's Forums) preceded the CHOGM from 16-18 April 2018. Hon'ble Prime Minister Her Excellency Sheikh Hasina led the Bangladesh delegation which included the Hon'ble Foreign Minister, Hon'ble State Minister for Foreign Affairs and Hon'ble State Minister for Women and Children Affairs. During the Commonwealth Heads of Government Meeting 2018, Hon'ble Prime Minister had a bilateral meeting with the Prime Minister of India at the sidelines of the CHOGM. She had bilateral discussions with UK Prime Minister at the Retreat Session. UK DFID Minister the Rt Hon Penny Mordaunt met the Hon'ble Prime Minister and had short discussions with her at the Women Forum. Besides, the Hon'ble Prime Minister had discussions with senior UK Ministers, Lords and senior political leaders. Hon’ble Prime Minister of Bangladesh Sheikh Hasina delivered a keynote speech at the event titled ‘Bangladesh’s development story: policy, progress and prospects’ at Overseas Development Institute in London during the CHOGM visit. People of Bangladesh very fondly remember the visit of Her Majesty the Queen Elizabeth II to Bangladesh in 1983. Former UK Prime Ministers Mr. James Callaghan, Mr. John Major and Mr. Tony Blair visited Bangladesh on different occasions. Most recently, British Foreign Secretary Mr. Boris Johnson visited Bangladesh on 09-10 February 2018. During the visit, he called on the Hon'ble Prime Minister and had a meeting with the Hon’ble Foreign Minister and discussed bilateral and international matters of mutual interest. The British Foreign Secretary appreciated the courageous decision of Hon'ble Prime Minister Sheikh Hasina and her Government to extend helping hands to the forcibly displaced ‘Rohingya’ people and welcomed her deep commitment to a safe, dignified and voluntary return of the ‘Rohingyas’. British Foreign Secretary also visited Cox’s Bazar and saw himself the plight of the ‘Rohingyas’ and he vowed to extend the support of the UK for a sustainable solution of the ‘Rohingya’ crisis. Earlier in November 2017, the DFID Secretary Ms. Penny Mordaunt, soon after the assumption of her Office and in her first ever overseas visit as International Development Secretary, travelled to Bangladesh and visited the Rohingya camps at Cox’s Bazar, and praised the Government of Bangladesh and the local communities for their continued generosity in helping the 'Rohingyas'. UK FCO Minister the Rt Hon Mark Field MP and Joint FCO-DFID Minister Alistair Burt MP visited Bangladesh in September 2017 just after the eruption of the Rohingya crisis while the UK FCO Minister of State Lord Ahmad of Wimbledon visited in August 2017. A good number of members of the UK Parliament including delegations from the International Development Committee, Labour Friends of Bangladesh, Conservative friends of Bangladesh visited Bangladesh recently and most of them visited the camps to see the situation of the Rohingya by themselves. 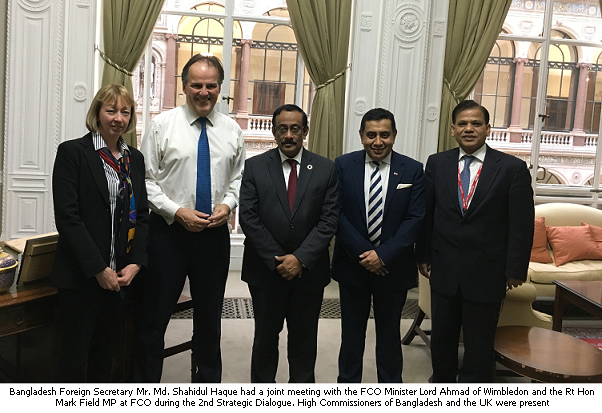 Visits of such a good number of UK Ministers to Bangladesh during the last few months reflect the growing strength of bilateral relations. 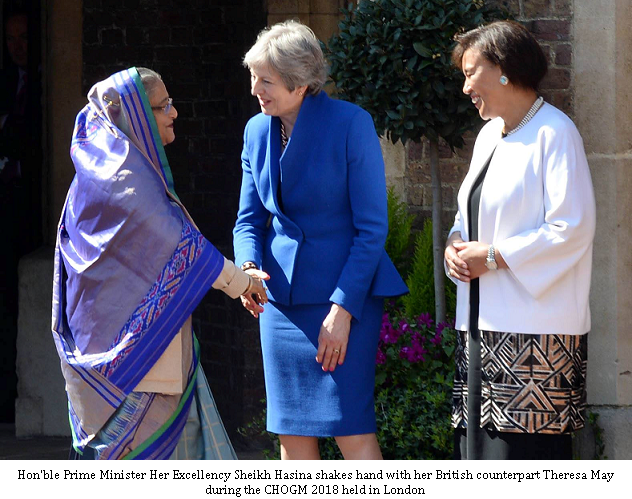 During the present and the previous tenures in the office, Hon’ble Prime Minister Sheikh Hasina officially visited the United Kingdom on different occasions. In January 2011, Hon'ble Prime Minister had a bilateral visit to the UK. In July 2012, she was in London for attending the opening ceremony of London Olympics. In August 2012, the Hon'ble Prime Minister visited the UK to take part in the ‘Hunger Summit’ organised by the UK Prime Minister David Cameron. The Hon’ble Prime Minister attended the ‘Girls Summit’ in July 2014 at the invitation of the British Prime Minister. During the recent stopover of the Hon'ble Prime Minister to London in early October 2017, Lord Ahmad of Wimbledon, FCO Minister of State for the Commonwealth and the UN and Special Representative of British Prime Minister paid a courtesy call on the Hon’ble Prime Minister at her hotel residence and conveyed British Prime Minister’s gratitude and sincere thanks for her bold and life-saving initiative in dealing with the 'Rohingya' crisis. Lord Ahmad also assured of the UK government's continued support in this regard. Bilateral relations between Bangladesh and the United Kingdom expanded and deepened in many areas including, trade, investment, education, people to people contact and cooperation in many international fora over the last four decades. Both countries decided in 2017 to set up a formal structure for regular engagement between the two Foreign Offices. A memorandum was signed in this regard and the first Strategic Dialogue under the new arrangement was held in Dhaka in March 2017 to review the entire gamut of bilateral relations and identify future areas of cooperation. The second meeting was held at Foreign and Commonwealth Office in London on 15 March 2018. Bangladesh side was led by Foreign Secretary Mr. Md. 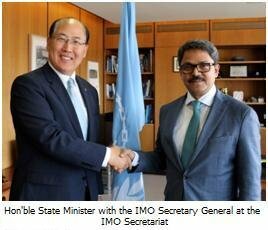 Shahidul Haque and the UK side was led by FCO Permanent Under Secretary Sir Simon McDonald. This second meeting of the Strategic Dialogue has been a positive way forward for bilateral relations with the United Kingdom as the two countries have agreed to work together very closely in many areas including, education and skill development, migration, interests of British-Bangladeshi diaspora in the UK, trade and investment, counter-terrorism and military cooperation. The two sides also agreed to foster greater cooperation in the various international fora including the United Nations and the Commonwealth. As an important link with the host government, the British-Bangladesh community has been making a significant contribution to the Bangladesh economy by enhancing trade and investment. The Community is thriving in the United Kingdom and has already made their footprints in the British mainstream business, profession, and politics. They are increasingly making position in the mainstream political parties and local decision-making bodies. A good number of them have been awarded with the titles like Member or Order of the British Empire (MBE or OBE) in recognition of their contributions to the British society. Around 100 British-Bangladeshi Councillors are playing a constructive role in the local Councils. Some of them are entrusted with responsibilities of Mayors and leaders of different Councils. 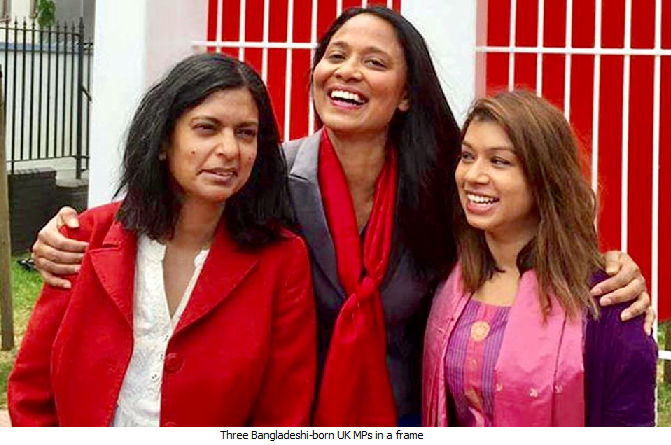 The Community has now three Members of Parliament namely Ms. Rushanara Ali from Bethnal Green and Bow, Ms Tulip Siddiq, granddaughter of the Father of the Nation Bangabandhu Sheikh Mujibur Rahman from Hampstead and Kilburn and Ms Rupa Huq from Ealing.